Yorkshire Entomolography – Page 536 – Life is a series of tiny little miracles, notice them. Entomological recordings by Paul Ashton. Following a morning visit to North Cave Wetlands and improving weather conditions, I decided to pay a visit to North Cliffe Woodland. 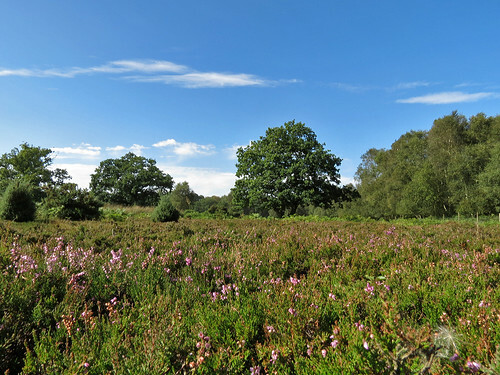 This is a cracking reserve and the heather on the heathland feels ‘alien’ to the more usual views of arable farming found in East Yorkshire. 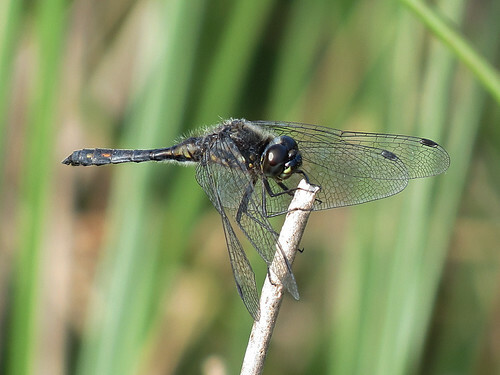 The warm conditions meant that all dragonflies were very active, either engaged in breeding behaviour, or feeding. 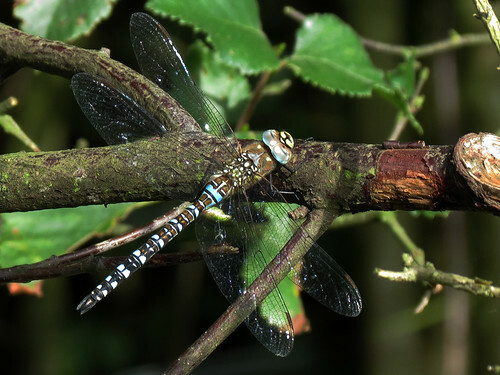 There were good numbers of Migrant Hawkers Aeshna mixta feeding along the woodland edges, careful scanning of the trees in sunny positions found several individuals also ‘hung up’. Common Darters Sympetrum striolatum were everywhere, constant being flushed as I walked around the perimeter. At the pond a male Common Hawker Aeshna juncea was constantly searching for females, chasing off any Migrant Hawkers A. mixta that tried to get near the pond. It was good to see a few more Black Darters Sympetrum danae holding territory, however so far I’ve not observed any females this year, so these individuals have more likely dispersed from other near-by sites. 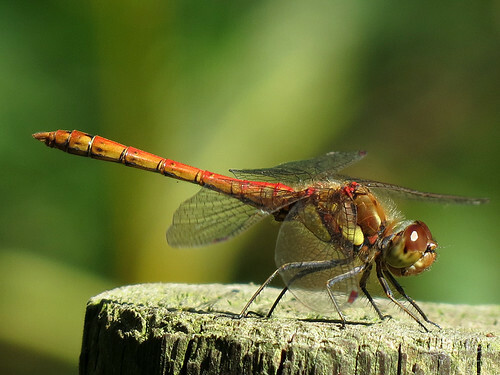 A few Ruddy Darters Sympetrum sanguineum were also paired up and attempting to oviposit in the pond, again constantly being harassed by the Common Hawker A. juncea. There were still good numbers of Emerald Damselflies Lestes sponsa around the edge of the pond, many paired up with females ovipositing into the Juncus grasses. A lone female Brown Hawker Aeshna grandis dropped in, but never got a chance to do anything, again being chased off. 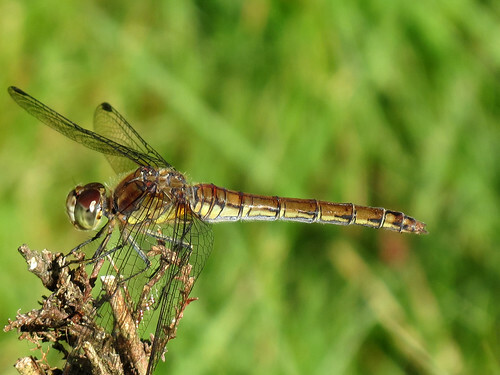 Leaving the heath a couple of Southern Hawkers Aeshna cyanea were observed, favouring the half shaded areas along the western footpath. Small Coppers Lycaena phlaeas were again the most abundant species, though numbers had dropped since my last visit, several now looking quite worn. Speckled Woods Pararge aegeria have increased in number, this being a species which is multi-brooded, its numbers fluctuate quite regularly through the year. 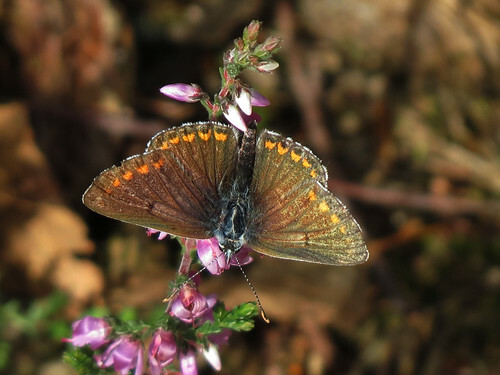 A couple of Brown Argus Aricia agestis were found on the heath, nectaring on the heather. Other species present were Large White Pieris brassicae, Small White Pieris rapi, Peacock Inachis io and Meadow Brown Maniola jurtina. 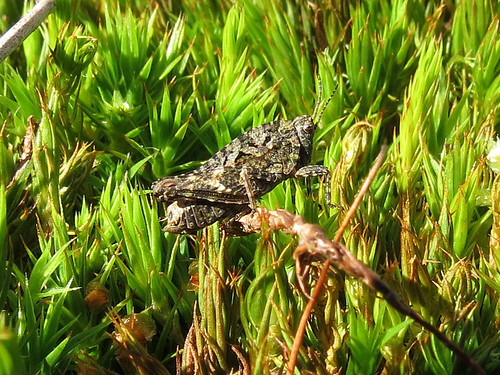 Recently I was advised that Common Groundhopper Tetrix undulata could be found on the heath, so this time I paid more attention to try to seek them out. previously I hadn’t realised how small they were, around 10mm in length, so you really have to watch out for small insects jumping out of your way, as you walk to find them. This approach paid off so the next challenge was to photograph them. Being so small I was quite pleased with the resultant photo, a species I’ve not seen before.